Chronic periodontitis (CP) and colonization of Porphyromonas gingivalis have been identified as risk factors for the production of amyloid plaque and Alzheimer disease (AD). Gingipains are cysteine proteases that constitute the major virulence factors for P. gingivalis. The authors of a study published online January 23 in Science Advances conducted more than 30 studies and demonstrated that P. gingivalis DNA and gingipain antigens are present in the brains of people with AD, and that orally available small-molecule gingipain inhibitors can cross the brain barrier, reducing P. gingivalis brain load and neurotoxicity. A neuroinflammatory response consistent with infection has been demonstrated in the brains of people with AD, as evidenced by activation of microglia, inflammosomes, and complement. P. gingivalis is an asaccharolytic gram-negative anaerobic bacterium that produces lysine gingipain (Kgp), arginine gingipain A, and arginine gingipain B (RgpB). The Kgp and RgpB load was found to be significantly higher in the brains of people with AD than in those of people without dementia (controls). Tau protein pathology correlates with cognitive impairment in people with AD. Ubiquitins are protein tags targeted for degradation that accumulate in tau tangles and amyloid plaques. The researchers found a highly significant correlation between RgpB and tau loads, as well as between Kgp and ubiquitin loads and RgpB and ubiquitin loads. In examining the correlation between the gingipain and tau loads, as well as between the gingipain and ubiquitin loads in the brains of participants, a spectrum of gingipain and AD pathology was demonstrated. This finding lends support to the concept of preclinical AD in which pathogenesis has already begun but symptoms of cognitive decline have not yet appeared. P. gingivalis DNA was identified in the brains of people with AD, as well as in cerebrospinal fluid (CSF) of patients with probable AD, which makes it possible that CSF P. gingivalis DNA may serve as a diagnostic marker in the future. Considering the demonstrated cytotoxicity and activity of P. gingivalis gingipains, their presence in the brains of people with AD, and their role in bacterial virulence, the researchers developed a library of potent small-molecule gingipain inhibitors. In vitro studies demonstrated that several of these molecules were effective in preventing P. gingivalis–induced cell death in a concentration-dependent manner. Broad-spectrum antibiotics were not cell protective. In vivo studies demonstrated that mice that received hippocampal injections of gingipains had significantly greater neurodegeneration than did mice that received saline injections. Furthermore, pretreatment with small-molecule gingipain inhibitors blocked this neurodegeneration. Broad-spectrum antibiotics did not prevent P. gingivalis–induced death, while gingipain inhibitors did. Moreover, concerns about the development of bacterial resistance, as well as the potential development of severe colitis induced by Clostridium difficile stemming from broad-spectrum antibiotics use, prompted the search for potent, selective, brain-accessible small-molecule gingipain inhibitors. The authors report that human clinical trials are currently in progress using the gingipain inhibitors COR388. In an aging population, medications used to treat chronic systemic conditions may contribute to peri-implant disease linked to negative dental implant outcomes. Researchers conducted a systematic review and meta-analysis to examine the association between the use of medications that may influence bone metabolism and dental implant failure (IF). The study was published in the October 2018 special issue of Clinical Oral Implants Research. The authors conducted a systematic review following the Preferred Reporting Items of Systematic Reviews and Meta-Analyses guidelines. Prospective or retrospective cohort, case-control, cross-sectional or randomized controlled trials investigating the association between intake of systemic medication and IF were evaluated for inclusion. The risk of bias was assessed using the Strengthening the Reporting of Observational Studies in Epidemiology statement for observational studies. The statistical analysis was conducted using the software package R 3.1.1 and meta-analyses were performed when feasible. Forty articles were considered for full-text evaluation. These were culled to 17 for qualitative assessment. Among these, 5 articles examined the association between IF and use of nonsteroidal anti-inflammatory drugs, 2 selective serotonin reuptake inhibitors (SSRIs), 2 proton pump inhibitors (PPIs), 7 oral bisphosphonates, and 1 antihypertensives. No meta-analysis could be conducted for the antihypertensives subset as only 1 study was identified. Similarly, no meta-analysis could be conducted for the nonsteroidal anti-inflammatory drugs subset as the preponderance of these studies contained no IFs in either the experimental (drug) or control (no drug) group. For both PPIs and SSRIs, the homogeneity of the included studies was rejected at the 5% level. The authors caution this should dictate careful evaluation of the results. Still, both the fixed-effects and the random-effects models indicated significantly higher IF rates in the experimental groups for the PPIs and SSRIs subsets. A high degree of heterogeneity was found among the oral bisphosponates subset. PPIs inhibit acid production in the stomach and may hamper implant osseointegration by reducing calcium uptake in the intestines. SSRIs, used to manage depression and anxiety, have a negative impact on bone mineral density and microarchitecture of cancellous bone via their antianabolic skeletal effects. Although these facts may explain the association of PPIs and SSRIs with increased IF rates, the other medication subsets analyzed in this article were not associated with increased IF, despite reports in the literature that they may interfere with osseointegration of implants. The authors advise cautious interpretation of these data, owing to the lack of homogeneity with respect to drug dosage, timing of intake, and timing of IF. They strongly advocate for prospective studies investigating the relationship between medications and implant outcomes, controlling for established confounders such as smoking and oral hygiene. They further stress adherence to European Federation of Periodontology and the American Academy of Periodontology guidelines for standardization on definition of peri-implant disease using clinical and radiographic assessments. Care-resistant behaviors (CRBs) are reported by nursing home (NH) staff as a significant deterrent to the provision of oral hygiene to residents with dementia. The aim of this randomized, repeated measures clinical trial was to examine the utility of Managing Oral Hygiene Using Threat Reduction (MOUTh), a nonpharmacologic, relationship-based intervention, versus usual methods of oral care delivery (control) in reducing the occurrence and intensity of CRBs and improvement of oral health in NH residents with dementia who resisted oral hygiene. Secondary outcomes included the duration of the oral hygiene event and whether oral hygiene activities were completed during the event. The results of the study were published in the December 2018 issue of Gerodontology. Patients were recruited from 9 U.S. NHs, and consent was obtained from legally authorized representatives. Inclusion criteria included age 55 years or older, dentate with at least 2 adjacent teeth or edentulous and using a complete denture in at least 1 arch, diagnosis of dementia, and identified by staff as being resistant to oral care. Forty-six patients in the experimental group and 54 in the control group contributed data to the project analysis. Trained research assistants blinded to treatment assignments were assigned to provide oral hygiene. Oral care for dentate patients consisted of brushing all teeth and the tongue with a soft toothbrush and fluoride toothpaste followed by use of interdental brushes and an antimicrobial mouthrinse. Oral care for edentulous patients included use of a soft toothbrush, denture cleaning paste and a denture brush. All study participants were observed receiving oral care from NH staff twice per day for 7 days to establish baseline levels of CRBs. On day 8, participants who were randomly assigned to experimental or control groups received oral care twice per day for 3 weeks from research assistants. In the experimental group, the MOUTh strategies used included establishing rapport with patient by approaching him or her at or below eye level with a calm, pleasant demeanor, avoiding elder speak, chaining, cueing, distraction, bridging, rescue, and hand-over-hand method. Occurrences of CRBs were assigned a binary score (behavior present or not). CRB intensity was assessed with the revised Resistiveness to Care Scale. Participants’ oral health was assessed using the Oral Health Assessment Tool (OHAT). Duration of oral hygiene was measured with a stopwatch. Completion of oral care was assigned a binary score (completed or not). During the 3-week intervention period, participants in the experimental group had twice the odds of assenting to oral care and completing oral care, both of which were relevant and significant, as did participants in the control group. The duration of oral care increased for both groups in the intervention period, but it was higher by 0.72 minutes in the experimental group, a statistically significant result. During the intervention period, the intensity of CRBs decreased in both groups. The decrease was greater in the experimental group, a result which was considered positive, although it was not statistically significant. Likewise, OHAT scores were better for both groups as a result of intervention, slightly more so for the experimental group, but again, not statistically significant. The authors point out that OHAT scores showed clinical improvements for both groups during the intervention period, which may indicate that oral hygiene is not considered a priority in NH settings. They note that this is the first randomized controlled trial of a nondrug–based intervention designed to decrease CRBs and improve oral health measures in patients with CRBs and dementia, a group that has typically been excluded in prior studies. The research assistants providing experimental group oral care were trained to implement strategies to prevent escalation of CRB severity. Thus management, rather than prevention of CRBs, appears to be responsible for improved oral care in patients with dementia. The authors suggest future studies evaluate optimal frequency of oral care activities, as well as protocols, for patients who have dysphagia and testing the efficacy of the MOUTh protocol in patients with dementia who reside in assisted living homes. The subjective sensation of dry mouth is termed xerostomia, and hyposalivation is measured objectively as a reduction in salivary flow, accompanied by changes in the composition of saliva. Researchers conducted a MEDLINE/PubMed search to examine current therapeutic strategies for salivary hypofunction. The results of their study were published in the December 2018 issue of Gerodontology. For the review, the authors conducted a search of the English-language literature from 1995 through 2017. Treatments for xerostomia were categorized as symptomatic, topical or systemic stimulants, and regenerative. Twenty-five clinical trials were included, of which 24 were randomized controlled trials. Increased fluid intake and use of salivary substitutes proved to be the most common symptomatic approaches to treating xerostomia. Salivary substitutes affect the oral mucosa directly, but do not enhance production of saliva. Three controlled clinical trials were selected to investigate the effects of salivary substitutes on xerostomia. No evidence was found that hydroxymethyl cellulose, polyglycerylmethacrylate, or xanthan gum relieved symptoms of xerostomia. Citric acid and malic acid acidify the mouth, prompting salivary stimulation. In the 3 randomized controlled clinical trials, both citric and malic acid improved xerostomia, but the sample sizes of the trials were small and the duration of follow-up was short. In addition, use of the acids may make patients prone to dental hypersensitivity, erosion, and caries. In 2 randomized clinical trials, no evidence was found to support a positive effect of sugarless chewing gum on hyposalivation. Three studies suggested that acupuncture was efficacious in relieving xerostomia. Four of 5 studies indicated a beneficial effect of pilocarpine on symptoms of hyposalivation in patients with radiation-induced xerostomia and Sjögren syndrome. However, as a result of being a cholinergic drug, pilocarpine can produce negative side effects. Two randomized controlled clinical trials did not support effectiveness of bethanechol in reducing xerostomia. Four trials demonstrated that cevimeline was useful in symptomatic and functional improvement for patients with Sjögren syndrome and those who had undergone radiation but caused nausea. In 3 studies conducted in irradiated rats, transplanted stem cells from bone marrow or adipose tissue significantly ameliorated salivary gland dysfunction. Animal studies also demonstrated promise of gene therapy in modulating radiation-induced salivary dysfunction. Sufficient evidence was not found for the use of hyperbaric oxygen in the treatment of radiation-induced xerostomia. Xerostomia causes significant suffering globally, and approaches to the management of salivary hypofunction are wide-ranging. Thorough review of the literature led the authors to observe that pilocarpine and cevimeline have the most pronounced efficacy in treating salivary hypofunction, but often produce negative gastrointestinal side effects. The use of citric and malic acids increase salivary flow but can cause dental erosion and caries. The use of salivary substitutes, chewing gum, bethanechol, and hyperbaric oxygen do not appear to be effective in ameliorating salivary hypofunction. The authors propose that randomized controlled clinical trials in humans be conducted to evaluate the utility of acupuncture, stem cell therapy, and gene therapy in relieving xerostomia. Advantage Arrest is the first and only American-made silver diamine fluoride (SDF), a must-have for every dental office. Advantage Arrest is the only tinted SDF formula, enhancing placement visualization, and is available in an economical 8 mL bottle and unit-dose packaging for enhanced asepsis. Advantage Arrest is an immediate and effective desensitizer (D9910), a discloser of incipient lesions (D1354), and a proven caries preventive agent (D1208). Elevate Oral Care preventive care consultants have conducted educational staff meetings for thousands of oral health professionals since launching Advantage Arrest in 2015. To purchase Advantage Arrest directly and/or schedule your informative staff meeting today click here. There are still seats available for Botulinum Toxins and Dermal Fillers for Every Dental Practice. 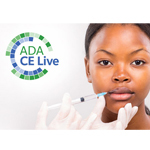 Join us May 10-11, 2019 at ADA Headquarters in Chicago to learn Botox and Dermal Filler treatment techniques that you will be able to immediately implement into your practice, led by Dr. Louis Malcmacher and his team at the American Academy of Facial Esthetics. Register now! The consulting editor for JADA+ Scan — Healthy Aging is Linda C. Niessen, DMD, MPH; Dean and Professor; Nova Southeastern University College of Dental Medicine.